50 digital touchscreen codes per lock. • APPLICATIONS - For offices, schools, hospitals, apartments, hotel/motel, residential, commercial and public buildings. • LATCH FACEPLATE - Standard 2 1/4" x 1 1/8" for 2 3/4" backset. Optional 2 1/4" x 1 1/8" for 2 3/8" backset. • PROXIMITY (RFID) CARD (STANDARD) - 2 pcs. included. Compatible with existing MIFARE infrastructure. Operates at 13.56 Mhz in accordance with ISO 14443A. Inductive distance up to 1 3/16". • RFID KEYFOB (OPTIONAL) - Operates at 13.56 MHz in accordance with ISO 14443A. Inductive distance up to 1 3/16". • ANSI STANDARDS - Meets or exceeds BHMA/ANSI 156.2 Series 4000 Grade 1 requirements. • POWER SUPPLY - 4 AA 1.5V Alkaline Batteries (comes standard in packaging). • CLUTCH - Clutch technology allows turning of lever without retracting latch, thus prolonging the life of the lock by reducing stress on the spindle and other parts. • CYLINDER & KEYWAYS - 6 pin solid brass "C" keyway standard. Schlage E, Schlage C-K, Russwin D1-2-3-4, Corbin 59/60, Corbin-Russwin L4, Sargent LA-LB-LC, Falcon/Weiser E, Arrow A, Yale 8, Yale GA and Kwikset. Can also accept Medeco, Assa, Kaba and Cal-Royal (HSK) High Security Cylinders. • WEATHER RESISTANT - All models are weather resistant for operating temperature ranges of +149°F to -4°F (+65°C to -20°C) and storage temperature ranges of +176°F to -22°F (+80°C to -30°C). • BLUETOOTH CONNECTIVITY - Lock can be managed/synced using the K3 (Apple) and K3+ (Android) app. • ACCESS LOG (AUDIT TRAIL) - The K3 app features a 24/7 activity log, so you can keep track of who accessed the lock. A timestamped access log can be shared by the Admin phone via email. 10,000 audit trail entries. • STRIKES - ASA strike standard, "T" and full lip strike available on request. • BLE GATEWAY CONNECTIVITY - Remote access/management of locks through the internet. • 50 digital touchscreen codes per lock. 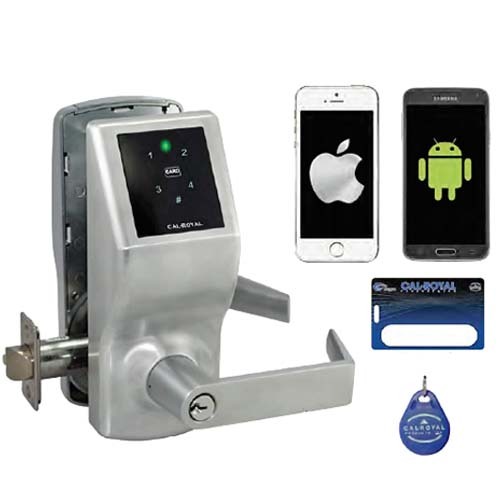 • Bluetooth Connectivity - lock can be managed / synced using the K3 (Apple) and K3 (Android phones without NFC), and K3+ (Android phones with NFC) app. • Admin Phone - a lock can only have one Administrator phone at a time. Only smartphones are used as Administrator. One admin phone can manage up to 250 locks. • Access Log (Audit Trail) - the K3 app features a 24 / 7 activity log, so you can keep track of who accessed the lock. A timestamped access log can be shared by the Admin phone via email. 10,000 audit trail entries. • Passage Mode - once enabled by the Admin, the unit is unlocked continuously until “Disable Passage Mode” is initiated. • Restricted Access Right - PL7100 can be programmed to specify the access period or intervals of users. • RFID Card or Key Fob (Standard) - compatible with existing MIFARE infrastructure. Operates at 13.56 MHz in accordance with ISO 14443A. Inductive distance up to 1 3/16”. • Weather Resistant - the PL7100 is designed to make sure that internal electronic parts are protected from moisture, dust, water and corrosion. All models are weather resistant with operating temperature of +149°F to -4°F (+65°C to -20°C) and storage temperature of +176°F to -22°F (+80°C to -30°C). • Low Battery Warning - when voltage is lower than safety power, PL7100 gives beep sound warnings after unlocking the device. • Non-Handed - PL7100 is reversible for left and right hand openings.